2nd Edition (i.e., 10th Anniversary Edition): As above, except that rulebook has been updated to fix all known errata. In 2004, MMP debuted a new form of ASL, the ASL Starter Kit #1 (ASLSK1), designed to introduce new players to ASL and to get intimidated past purchasers of ASL to actually try the darn thing. Condensing the gist of the ASL infantry rules into just 12 pages of rules (and actually, much of that is illustrations and examples), ASLSK1 designer Ken Dunn distilled the essence of ASL into a small and elegant package. Publishing the Starter Kit was probably the single smartest decision made by MMP in its years of stewardship of ASL; the Starter Kit has been reprinted a number of times in the years since 2004. ASLSK1 provides German, American, and Soviet counters, as well as six fast-moving scenarios, the first of which is a perfect introductory scenario, as it does not use any support weapons and introduces units onto the map a few at a time. Its two geomorphic mapboards debuted the “new style” of ASL maps. Older geomorphic maps were printed on paper, which was then glued onto cardboard to create mounted mapboards. The new geomorphic maps are printed directly onto a thick cardstock. As a result, they are thinner (and presumably less durable) than the old style maps. MMP announced at the time that all its future geomorphic maps would use this new style; a decision that was unpopular in some circles, but seems clearly justified by the extreme cost of printing mounted mapboards (few other wargaming companies use any mounted mapboards). The new maps also use computer graphics rather than the handpainted style of earlier maps; many ASLers were sorry to see this development. With regard to the particular maps in ASLSK1, they are nothing to write home about–the terrain is necessarily limited, to keep the rules limited (later ASLSK maps are more varied). The quality of the new computer graphics has been better on other ASL products than in the ASLSK maps. MMP planned, assuming ASLSK1 was well-received, to release two future ASLSK games, one that would introduce guns to the system and a third that would introduce vehicles. As the ASLSK popularity grew, MMP has made it clear that the Starter Kit has a future beyond the first three modules. This has led to some uneasiness among ASLers, most of whom were happy with the Starter Kit as a successful vehicle to bring “new blood” into the hobby but fewer of whom would equally embrace a more comprehensive system that actually threatened to become a rival to ASL. Yet this is more likely than not the future for the ASLSK. MMP has made French (http://www.cote1664.net/article.php3?id_article=74), Spanish (http://www.boardgamegeek.com/game/9823 and http://http://www.boardgamegeek.com/game/15126), and Japanese (http://www.multimanpublishing.com/downloads/ASLSK1_jpn.pdf) language rules for the ASL Starter Kit available, but as downloads rather than as printed products, marketed and sold in those countries. 2nd Edition (i.e., 10th Anniversary Edition) comments: In June 2014, MMP released a new edition of ASLSK1. It is identical to previous editions, except that it includes a new, updated rulebook that fixes all known errata. When I was a boy growing up in West Texas, my parents took me to Carlsbad Caverns National Park, which boasts some of the largest, most spectacular caves in the United States. When I approached the cave entrance, a relatively modest crack in the earth, I had no idea at all what a huge world waited on the other side. We walked for miles far underground, gaping at a never-ending series of subterranean spectacles, yet there were still so many caves and tunnels we had not seen?which were not, in fact, even open to the public. It was an entire new world to explore?a world to which I returned repeatedly over the years. 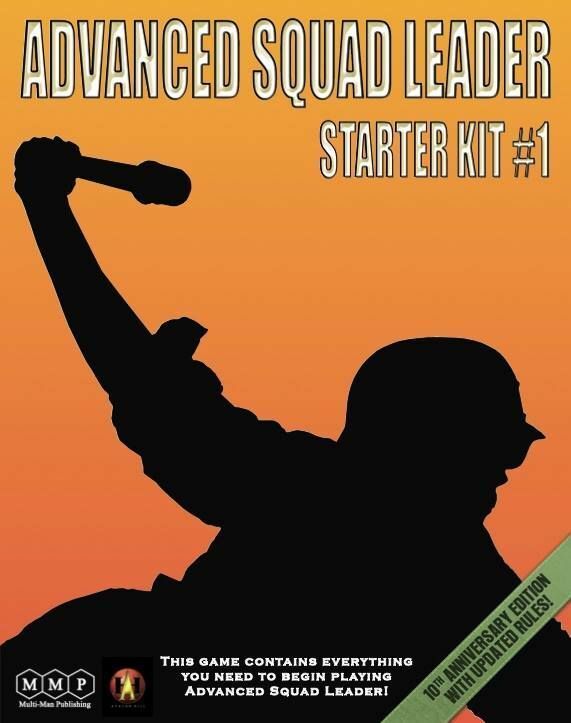 The Advanced Squad Leader Starter Kit (ASLSK) is quite a bit like that cave entrance. It is a modest package that enables people to explore a huge new world. 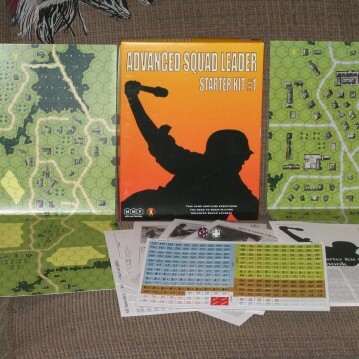 Fun to play on its own merits, it also guides gamers into the universe of Advanced Squad Leader (ASL), simultaneously the most detailed and most exciting board wargame depicting World War II tactical combat. ASLSK has a distinguished lineage. In 1977, noted game designer John Hill debuted Squad Leader, a squad level game that Hill designed to capture the key moments of decision for World War II infantry leaders. Imagine, for example, a lieutenant faced with an enemy-held building across a street. At some point, that lieutenant must order his men into the road. Has he sufficiently suppressed enemy fire? Should he wait a little longer? It is that type of decision that Hill wanted his players to make, and he succeeded magnificently. Squad Leader became an instant hit and spawned a series of sequels. 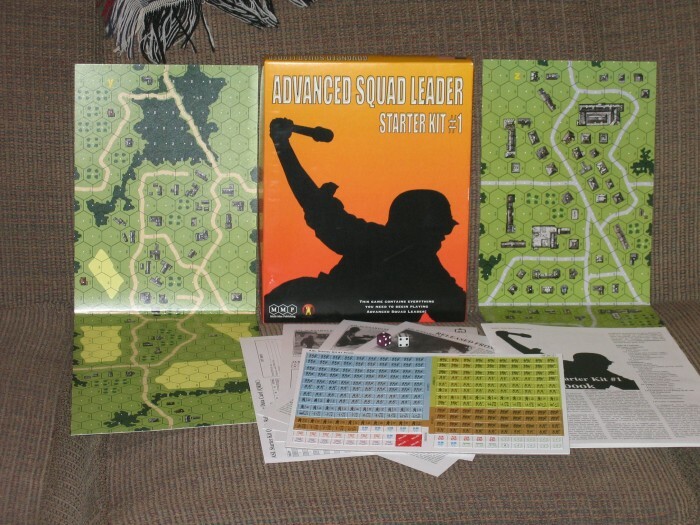 In the 1980s, Avalon Hill took all the Squad Leader games, combined them, rewrote the rules, and added many new concepts to create ASL, the ultimate World War II wargame. While still capturing John Hill’s moments of decision, ASL greatly expanded the field of play. Players had control of units ranging from reindeer-drawn sledges to amphibious landing craft, and could play scenarios set anywhere in the world, from the jungles of Sumatra to the steppes of Russia to the beaches of Normandy. ASL came, however, at a price in complexity. The rules were long and somewhat intimidating, especially to the casual gamer. Many people bought all the ASL modules, but never got around to playing the game. Others were simply too daunted by the rules to purchase them at all. And still others looked curiously at ASL, but didn’t want to commit themselves to the hefty entry cost. The ASLSK is perfectly designed for all these audiences. It provides the essence of ASL (and its predecessor, Squad Leader), without all of the special circumstances. For an almost trifling $24, it provides a perfect way to enter the ASL world. A single countersheet provides squads, weapons, and leaders for American, German, and Russian troops. 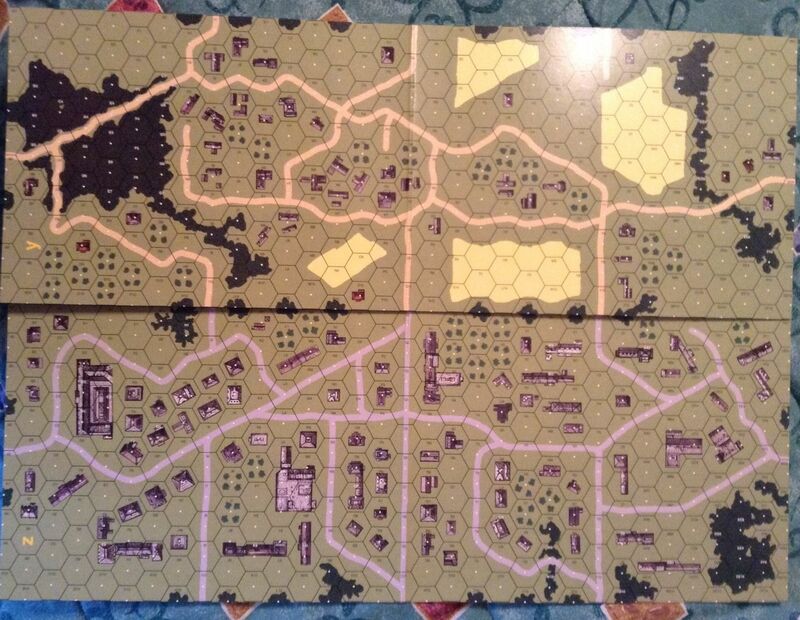 Two geomorphic mapboards (meaning that they can be placed together in different configurations to recreate different situations) featuring urban and village terrain provide the battlegrounds. The mapboards are mounted on thick cardstock, as opposed to the more traditional mounting of older ASL and Squad Leader boards. This is not an exception created for the ASLSK; the prohibitive cost of traditional mounted mapboards means that this is the future for all ASL maps. How truly accessible is the ASLSK? The rulebook, which covers infantry combat only (artillery and vehicles will be introduced in future starter kits), is only 12 pages long?and those dozen pages include copious full-color illustrated examples. The rules themselves would fill only around eight pages. This drastic distillation of the ASL rules is accomplished by leaving out the chrome and special circumstances that ASL is notorious for. Instead, players are allowed to concentrate on the essence of the infantry rules: fire, movement, and leadership. What is remarkable is how faithfully the spirit of ASL is maintained in this selected subset; moreover, it is 100% upwardly compatible with its big brother. ASLSK players need unlearn nothing when they are ready to move on. The rules, moreover, are easy to grasp. Since its release, I’ve taught the ASLSK to about nine different people; typically, it took me only 20-30 minutes to get them ready to play. Two people who have never before encountered ASL will be able to learn by themselves almost as easily. It is also a perfect game to use to introduce a child to wargaming. The ASLSK contains four German vs. American scenarios and two German vs. Russian scenarios. The scenarios are all interesting and well-balanced. The first scenario, “Retaking Vierville,” is a perfect introductory scenario, with no support weapons and featuring German and American units that trickle onto the battlefield (although the first time players may try this scenario it may seem to favor the Americans, players will eventually find it balanced). The second scenario, “War of the Rats,” takes players to the streets of Stalingrad, and introduces toys such as flamethrowers and demolition charges. A flamethrower also appears in the third scenario, “Simple Equation,” featuring Americans attacking Germans in fortified buildings in the avenues of Aachen. The fourth scenario, “Welcome Back,” transports players to the snowy battlefields of the Battle of the Bulge, while “Clearing Colleville” features a meeting engagement in Normandy. The final scenario, “Released from the East,” returns combatants to the Russian Front, where fur-clad Siberians aided by “General Winter” attack desperate and freezing German defenders. The scenarios themselves play very quickly; it is possible to play two in an evening. Experienced ASL players will find some subtle differences, due mostly to the lack of concealment counters, bypass movement, and snipers. Some changes help the attacker, some help the defender. But ASLers will quickly realize that it is not a different game, it is just ASL stripped to the essence. Multiman Publishers, the caretakers of ASL since Avalon Hill’s demise in 1999, deserve a great deal of praise for this introduction to the world of ASL. The components are top-notch, there is no significant errata (the most confusing: the definition for ‘CX’ counters, Counter Exhausted, was left out of the glossary), the scenarios are fun and well-balanced, and the game aptly fulfills its intended purpose: to allow gamers a painless and fun way to enter the infinite world of ASL. Even in its short life to date, the ASLSK has proven extraordinarily popular. There’s a reason for this. Sometimes big things do come in small packages, and the ASLSK is a great little package. Go get your spelunking gear and try it.